I've gone camping over the Christmas and New Year's break. My Husband's Uncle has a wee farm out the back of Russell and we've pitched a tent on one of his fields. The kids are enjoying swimming in the creek for hours on end and exploring the bush. 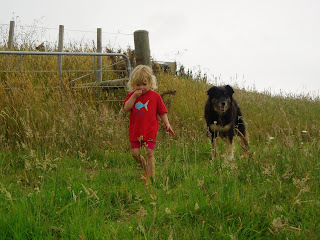 We've just popped back home to pick up a few forgottens and check the animals. So Happy New Years, Merry Christmas everyone. I'll be back in a couple of weeks. WIP Wednesday with a no-snit machine binding. I am so freakin' excited about his it's not funny. No snit machine binding! Hand binding is a pain. It takes literally hours and for small projects, you wonder if it's worth it. 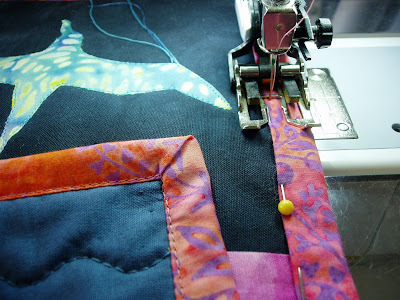 But I tried machine binding once and wondered how on earth people ever got it to work (yes, many small snits were had). 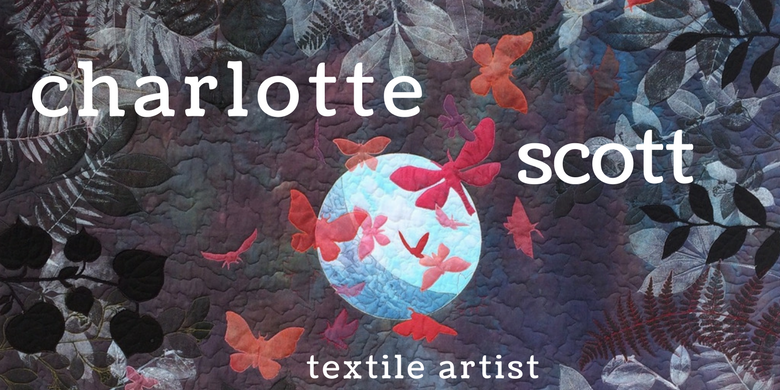 But then I found this tute on this blog and now I am one happy woman! You can see I missed the corner just a teeny bit, but considering this is the very first one, I'm still a very happy woman! 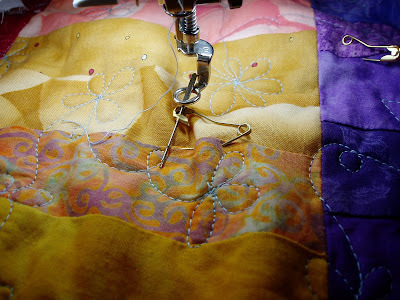 I might just go sew another one..... BECAUSE I CAN! Everyone came for the walk. 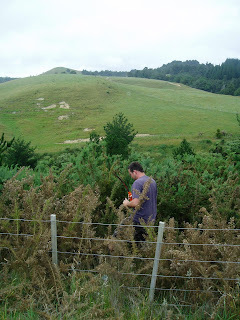 Only Dear (Brave) Husband got to go through the gorse, although the kids wanted to. 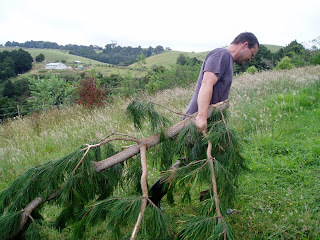 He also got the job of hauling the tree back up the hill. 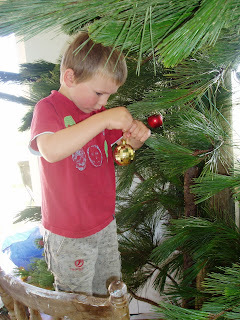 But guess who's really into decorating everything in sight this year?! Being a lady of 'leisure' has it's advantages. I get to paint my toenails, eat bonbons and watch daytime televsion.......not. 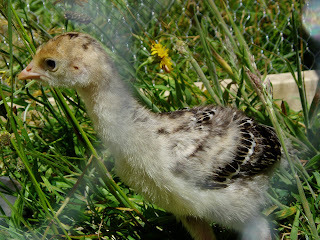 The turkeys are getting big enough for some outside time. Every morning I catch them and put them in a run outside, this involves lots of squawking and flapping (mostly from them). Every evening I catch them again and put them back in their brooder box inside, even more squawking and flapping. I feed them and change their water, and I feed and change the chicks water while I'm at it. I'm still milk feeding the calves twice a day. 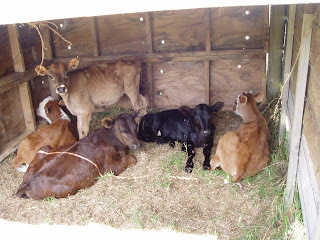 But I'm cutting down their morning milk as I'm planning to wean them soon. Instead, I lug big buckets of calf meal to them. Gloria has lost her famine-victim look and is developing a fetching black tinge to her muzzle. I have started a garden! And on my days without the kidlets, I get to spend about and hour and a half in here before it gets too hot for digging. 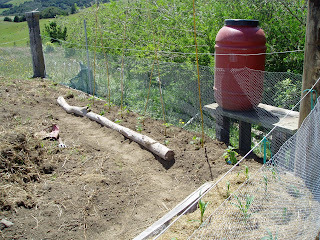 It's rained once in the last two months, so I lug the washing machine water, the sink water and the bath water out here to give the seedlings a fighting chance. 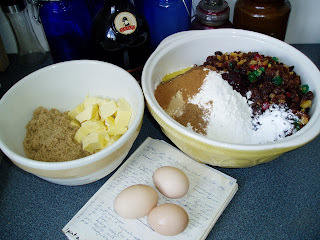 And in between housework, kidwrangling, quilting and blogging, I've finally baked my Christmas Cake. Now, where did I put that last bonbon? Let this be a lesson to you. If you look closely, the needle actually goes through the pin. Lucky it didn't break and get embedded in the quilt (or me). So it you think you are clever, and you'll just skirt close to your basting pin........don't try it! This little one is a Barnevelder. 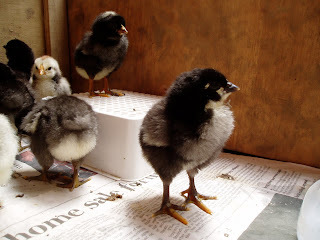 A dutch breed, beautiful dark brown feathers with black lacing and will lay dark brown, speckled eggs. The white ones: Light Sussex up top, will be white with a black necklace and black tail feathers; down the bottom is Faverolle, very rare, has five toes (see them?) and will have a beard. 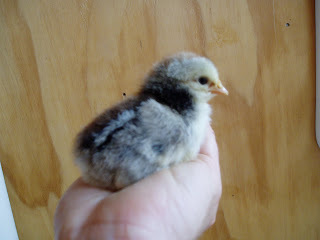 And this one I think is a cross between my Silver Laced Wyandotte rooster and one of my Blue Orpingtons. They are so funny when I drop teeny bits of broccolli and comfrey into their box. Think of a gang of kids having a lolly scramble! Except there are no parents to step in and comfort the losers. 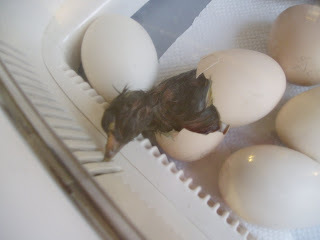 I'm showing you the pic of the finished product first because, to be frank, hatching chicks are quite grotesque. They started hatching early, which is a sign I had my temperature too high, so I need to get a thermometer to double check my incubator's settings. 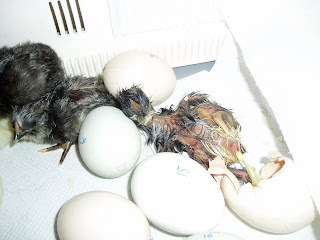 Early hatching and too high a temperature can be associated with malformed chicks and sticky/bloody navels, but I seem to have escaped that, phew! On Thursday, when I filled up the water reservoir, I heard a little 'peep' so I opened up the lid and could see that a couple of the eggs had little pip holes in them and some of them were chirping at me and rocking! I turned up the humidity to the max it would go (70%) to help keep their membranes soft and left them to it. 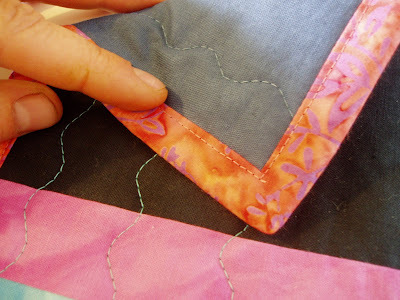 I go quilting on Thursday night and my husband rang me there and told me, "There's this noisy little bird flopping round in the incubator!" I didn't rush home straight away, but must confess I was a little tempted! I left it in there overnight to fluff up and by the morning it had been joined by three more. I had to go to work but saw two more hatch before I left. 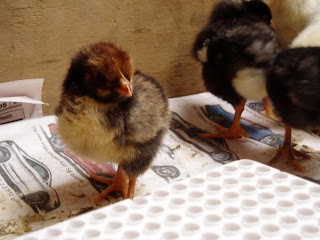 I had transferred the fluffed up ones into the brooder box by then. They had a heat lamp, food and water and I crossed my fingers that they would be okay. I needn't have worred! 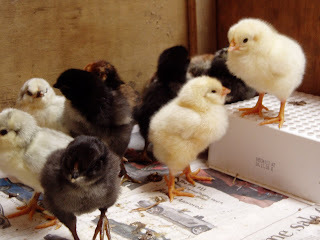 Chicken babies are incredibly self-sufficient (unlike the blasted turkey poults). By the time I got home, there were only a few to go. My son got to watch one hatch, although he got a little inpatient.